In 2017, PocketConfidant AI published two articles; the first to define coaching and the second to explain how a robot could be a coach. A few months later, Team PocketConfidant responded to APECS, the Association for Professional Executive Coaching & Supervision with an article on AI and Coaching. Energized by a passionate and committed team and the support of experts, Team PocketConfidant has also addressed important topics such as the development of critical thinking through technology (written with Dr. Roy van den Brink-Budgen, expert in critical thinking), explained how a tech startup is building its Ethics (a new article to be published soon on Ethics), and shared the main technology trends relating to coaching and human support observed during CES 2018 in Las Vegas. Today, Team PocketConfidant is positioned to be a key global contributor to human empowerment at scale with technology, leveraging the principles of coaching to maintain an ethical approach to business and innovation. Team PocketConfidant is glad to work with the International Coach Federation to support the human coaching community in order to ensure that the practice of coaching benefits from ethical technological development, reinforces the work of human coaches and educates the global market on what is coaching, as the practice still remains unclear for many people. 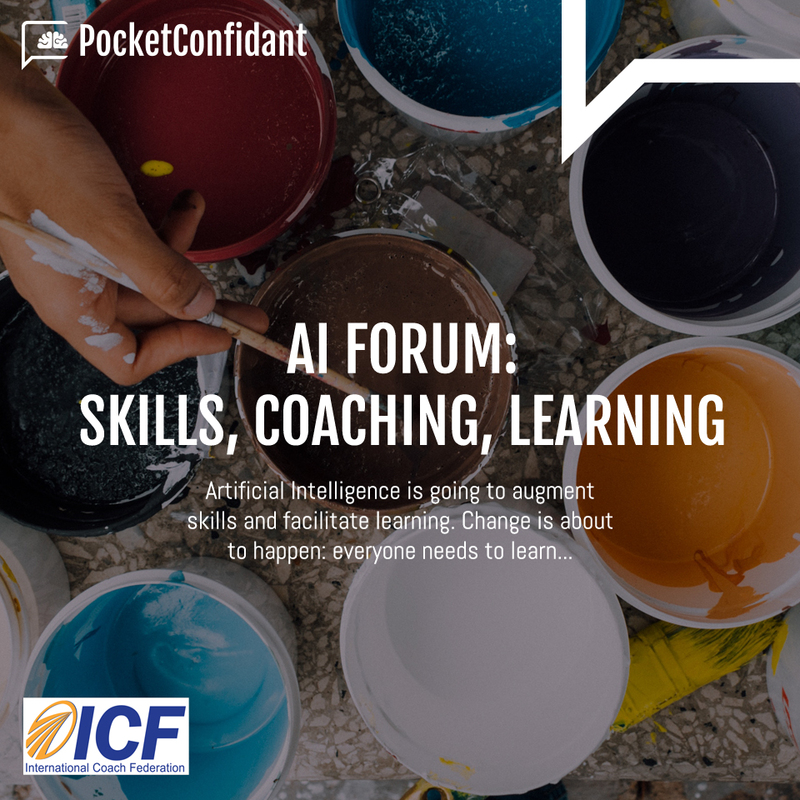 Having written an article to share global insights on coaching during the International Coaching Week 2017, Team PocketConfidant joins the 1st Forum for Coaching and Artificial Intelligence in Paris in April 2018, organized by ICF France. Supporting our convictions and work to empower people around the world, Andreas Schleicher, from the OECD, recently made a call for Charles Fadel’s book addressing the skills identified by the United States-based Partnership for 21st Century Skills (P21) as the most important skills required for 21st century education: critical thinking, communication, collaboration, and creativity. “Future economic growth and social progress rely on innovation. In addition to technical know-what and know-how, the core skills for innovation are critical thinking, creativity, problem-solving, global collaboration and communication (see for example OECD, 2010a; Toner, 2011)”. It has become an economic imperative to support people through change, enable everyone to align to their goals and values within their communities, and strive for personal growth. Team PocketConfidant believes that to change the world, we all need to deliberately practice self-coaching activities and embed them in any kind of learning initiative; that can be through school programs, employee programs or citizen projects. AI is going to help us take a new step in human learning. It is now a reality, nicely explained in this article, or in this TED talk. The world is in our hands and even though governments are attempting to address global economic and social challenges, the first person able to drive a cultural change… is us! “Coaching is unlocking a person’s potential to maximize their own performance. It is helping them to learn rather than teaching them.” Timothy Gallwey.